On 27 August 2016, His Beatitude Metropolitan Rastislav of the Czech Lands and Slovakia, while on official visit to the Russian Orthodox Church, visited the Laura of the Holy Trinity and St Sergius. At the holy gates of the monastery, His Beatitude Metropolitan Rastislav was met by Archbishop Feognost of Sergiev Posad, abbot of the Laura of the Holy Trinity and St Sergius; Archimandrite Pavel (Krivonogov), dean of the Laura; Hegumen Daniil (Vasilenko), acting vice-rector for educational work of the Moscow Theological Academy; Rev. Mikhail Bodanov, assistant for public relations to the abbot of the Holy Trinity and St Sergius Laura; the brethren of the monastery; and students of the Moscow Theological Schools. The Primate of the Orthodox Church of the Czech Lands and Slovakia and the members of his delegation venerated the holy relics of St Sergiues, Hegumen of Radonezh, and the shrines of St Serapion’s Chamber. His Beatitude Rastislav was accompanied by Archbishop Juraj of Michalovce and Košice; Archbishop Michal of Prague; archpriest Nikolai Lischenyuk, rector of the Russian Orthodox Church’s Representation in Karlovy Vary; Hieromonk Alexander (Halushka), secretary of the Representation of the Orthodox Church of the Czech Lands and Slovakia in Moscow; and archdeacon Maxim (Durila), a cleric of the Prešov diocese. The guests were accompanied by Bishop Tikhon of Podolsk, vicar of His Holiness Patriarch Kirill of Moscow and All Russia. 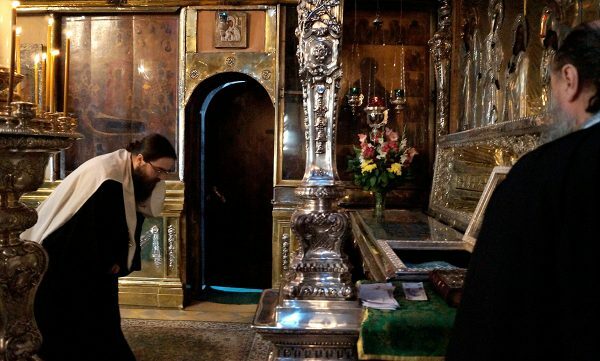 At the Cathedral of the Dormition of the Most Holy Theotokos, His Beatitude Metropolitan Rastislav venerated the relics of St Maximus the Greek and St Innocent (Veniaminov), Metropolitan of Moscow and Apostle to Siberia and Alaska. The guests then proceeded to the Moscow Theological Academy, where they visited the Church of the Protecting Veil of the Mother of God and the museum of church antiquities.